Gwen McKee and Barbara Mosely are at it again! In their quest to preserve America’s food heritage, they traveled to the Great Lakes Region of the United States. 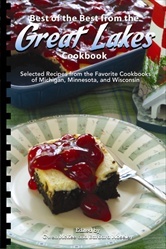 In this their 9th volume in the Best of the Best Cookbook series, they focus on the states of Michigan, Wisconsin, and Minnesota. There are in total 396 recipes from this region. You will find recipes for every occasion and meal of the day. There are several seafood recipes as well as a variety of fruit and vegetables. Wisconsin cheese is well represented too. Each recipe is detailed and easy to follow. Like their previous cookbooks, you will find exciting photographs and a wealth of trivia and information about the region. So the next time you want to bring home food from the Great Lakes region, pull out your Best of the Best from the Great Lakes cookbook. You might enjoy a bowl of Wisconsin Beer Cheese Soup or a plate full of Lake Michigan Fish Boil. How about a slice of Caramel-Apple Sundae Cheesecake for dessert? Yum!